Is Your Home Ready for Daylight Savings Time? Daylight Savings Time ends early Sunday morning (Nov. 6), which means most people in the U.S. are “falling back” an hour. With this time shift, smart home technology will be put to the test in adjusting to the new time schedule and keeping your home warm in the cooler months. But I am not worried because I have the awesome Lyric T5 Wi-Fi Thermostat from Honeywell. - Warmer Wake-Ups - Make sure the thermostat is set to kick-on and get the home ready for earlier, darker and colder wake ups. - Set the Scene - Build scenes and shortcuts in the Lyric App to make sure home automation is ready to hit the ground running on November 6. - Gut Check - Like changing out wardrobes for cooler temperatures, make sure to check the heating system for the increase in activity, including changing out whole-house air filters or humidifiers if needed. Plus! By using smart appliances like the Lyric T5 Wi-Fi Thermostat, which sync with time zone they’re programmed in, there’s one less thing to worry about during this time of year. I love that I now have warmer mornings without having to run freezing to the thermostat to quick turn it up and I don't have to worry about remembering to turn it down at night. And when we leave for vacation we never have to worry that we didn't turn the thermostat down. This is sure going to save us money and freezing mornings this winter. 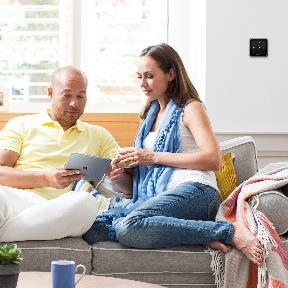 You can purchase the Lyric T5 Wi-Fi Thermostat for $149.99 from the Honeywell website.